OK, so have you had your fill of Caprese? Are you getting a little tomato-ed out? 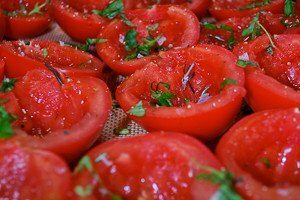 Here is a way to make more delicious tomatoes – and these will also keep for a week in the fridge! Consider stuffing these with handmade Ricotta cheese and mint. makes 24 tomato halves, ready to stuff with fresh ricotta and mint, drizzle with olive oil and serve with goat cheese and olives, or one thousand other ideas you may imagine! 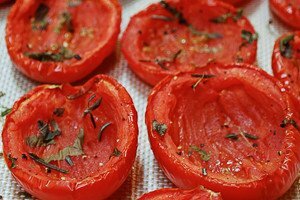 Place the tomato halves, skin-side down, on a baking sheet. Drizzle with oil and sprinkle with oregano, garlic, Maldon salt and a little black pepper. Roast in a 250°F oven at least 2 hours until shrunken.